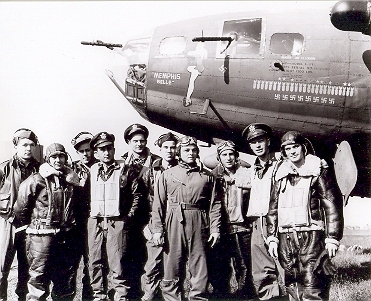 This lovely photo captures a classic moment in history of the legendary crew of the B-17 Flying Fortress "Memphis Belle". The date June 7th, 1943, the location, an English Air Base, and the moment in time is of course when 25 missions over enemy territory had finally been completed. The crew is as follows left to right: Tech. Sgt. Harold P. Loch. of Green Bay, Wis., top turret gunner; Staff Sgt. Cecil H. Scott of Altoona, Penn., ball turret gunner; Tech. Sgt. Robert J. Hanson of Walla Walla, Washington, radio operator; Capt. James A. Verinis, New Haven, Conn., co-pilot; Capt. Robert K. Morgan of Ashville, N. C., Pilot; Capt. Charles B. Leighton of Lansing, Mich., navigator; Staff Sgt. John P. Quinlan of Yonkers, N. Y., tail gunner; Staff Sgt. Casimer A. Nastal of Detroit, Mich., waist gunner; Capt. Vincent B. Evans of Henderson, Texas, bombardier and Staff Sgt. Clarence E. Wichell of Oak Park Ill., waist gunner.